Obesity is a growing problem in the world. Every year, people get fatter. 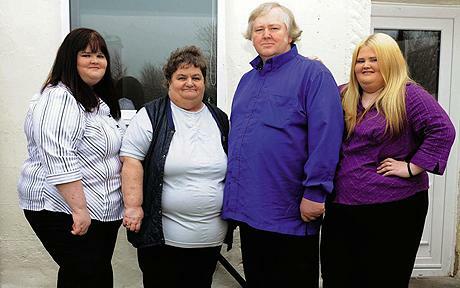 Eventually, if we all become like the Chawner family in Blackburn, England, we’ll be too fat to work. At least, that’s the reason they give for why they draw £22,508 a year in disability benefits and government support. It’s not just husband Philip and wife Audrey (each weigh 24 stone or 336lbs>) either. Daughters Samantha (18 stone or 252lbs.) and Emma (17 stone or 238lbs.) are also living on the dole, too. No doubt they’re following their parents’ footsteps and joining the family business. Unfortunately, over $31,000 a year in free money isn’t enough to support the family lifestyle. Here’s a great quote from the article regarding what the family’s £50-a-week grocery budget gets spent on. “We have cereal for breakfast, bacon butties for lunch and microwave pies with mashed potato or chips for dinner,” Mrs Chawner told Closer magazine. “All that healthy food, like fruit and veg, is too expensive. We’re fat because it’s in our genes. Our whole family is overweight,” she added. Now, I don’t know what bacon butties are, but I can pretty much assure you that anything made from bacon is bad for you. Microwave pies with mashed potatoes or chips? Those are also bad for you. Sugary breakfast cereals? Yeah, you get where I’m going with this. Maybe obesity does run in the family, and maybe fruit and vegetables are expensive, but you could easily substitute bacon for chicken a few times a week, couldn’t you? Or switch to a lower calorie cereal? Maybe replace some of the frozen bags of potatoes with frozen bags of cheap vegetables like broccoli? Losing weight is hard, believe me. I used to be over 300 pounds myself at one point (I still managed to have a job, too) before slimming down to 240, then dropping more weight to get to 185. It’s something I had to do. Once my father got diagnosed with diabetes and had to change his lifestyle, he needed moral support so I cut back on my sugar and white starch/flour. After I lost a bunch of weight that way, I started to cut my calories and exercise. And now, here I am, four years later. It’s not rocket science. If you use something like The Daily Plate, they can even tell you how many calories you need to eat per day to lose a pound or two a week and they have a list of thousands of food items you can choose from to track your progress. If I can do it, as lazy and bad with math as I am, then anyone can do it. I just wish I had saved my fat to power my car.